If you’re a skilled creative thinking about going into freelancing, this read is for you. 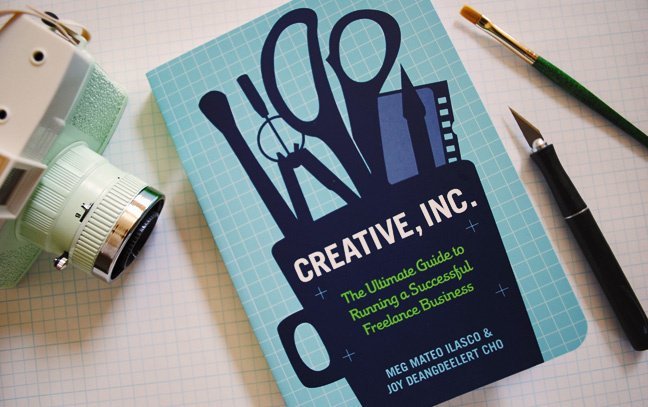 Creative, Inc. is a comprehensive guidebook aimed at giving you the confidence, skills and knowledge you need to start your own business in a creative field. Established freelancers may also want to take a look at it if they’re looking to grow in their industry. The book, laid out in fun designs and illustrations, is a quick and easy read. There are super detailed sections on setting up shop, marketing, working with clients, managing payments, bookkeeping, balancing work and life, and basically anything else a budding entrepreneur should know. The authors, creative entrepreneurs Meg Mateo Ilasco and Joy Deangdeelert Cho, also interview several successful freelancers who offer their personal advice on focus, collaboration, self-promotion, and more. There’s even a small section at the end of the book filled with helpful resources — lists of professional organizations to join, links to job boards and suggested administrative tools. It goes without saying, Creative, Inc. should only be a starting point in your research. You’ll need to depend on your own smarts and resourcefulness to gather additional information that caters to you and your line of work. As Ilasco and Cho write, “Freelancing takes vision, dedication, hard work, organization, business savvy, and, of course, a true love of your art.” It won’t be an easy road ahead, but the reward of being your own boss may well be worth it all. Have any thoughts on this book or any other great resources for freelancers? Share them in the comments below! Craft, Inc. (Revised Edition): The Ultimate Guide to Turning Your Creative Hobby into a Successful Business by Meg Mateo Ilasco — This read is for crafters who want to turn their hobbies into a living. You’ll learn how to put your products together, write a business plan, sell online, market through social media, and more. Blog, Inc.: Blogging for Passion, Profit, and to Create Community by Joy Deangdeelert Cho — This expert guidebook teaches bloggers how to start and design their blog, finance their enterprise, attract readers, and more. “The Best Books for Freelancers” — Freelance Switch made this awesome list of must-reads for independent contractors. Check ‘em out! the house without a sketchbook. © 2012-2015 KILLER CREATIVES //Theme by Towfiq I.